Here we go again, on Fishing in the Discount Bin. You know how it is, I watch a movie and blog about it. 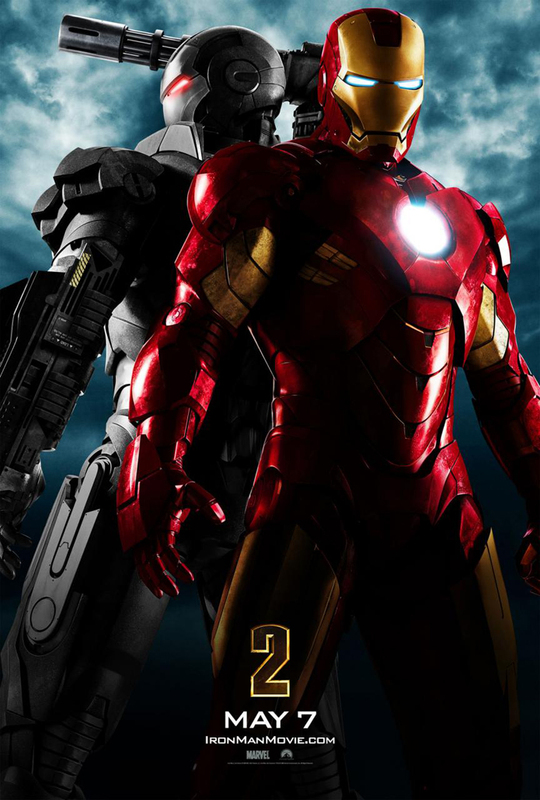 I'm working my way through Marvel's Phase 1, and today we get to Iron Man 2. Well, I actually got to it on January 21, 2018, which is when I originally wrote this. In a way, it's not fair to think of Iron Man and The Incredible Hulk as being part of Marvel's Phase 1. If anything, they were Phase 0. They were the test case...the prototype. They wanted to see if they could get their own movie studio off the ground, and then create a cinematic universe later. Best case in point: the Nick Fury cameo at the end of Iron Man. The story that director Jon Favreau told in the press at the time was that he slipped that in as a fun Easter egg, given that SHIELD was already part of Iron Man's plot. But, when the buzz started circulating among the fans ("Oh my God, does this mean they're going to do The Avengers? "), that's when Marvel decided to commit to the Marvel Cinematic Universe as we know it, and before the summer of 2008 was out they had announced the rest of Phase 1. The Avengers - July 2011. And people were...actually, kinda pissed off. Chiefly, Iron Man director Jon Favreau. Marvel made the announcement before Favreau had signed on to direct, and Favreau really wanted to come back. So there were some hasty negotiations made throughout the rest of 2008 before Favreau was signed. And then, they had to rush to make that May 2010 release date. The whole thing was kind of rushed, which is probably why people don't hold it in as high regard as the original. The experience kind of soured Favreau on directing Marvel movies, because now that the Marvel Cinematic Universe was a Thing, Marvel now had a lot more say. It's kind of funny. Watching it again tonight, I see that it has a lot of the same problems that I have with other "franchise starters:" they cram in so much stuff to set up further sequels that the story suffers for it. I mean, Black Widow is only in there to start setting up The Avengers. Agent Coulson is only there to tease Thor. They rush to get Rhody into the War Machine suit AND add the loophole of making Tony Stark simply a consultant on the Avengers Initiative as a plan B for The Avengers. Oh, you didn't know that? I know it confused a buddy of mine when the film came out. See, when Robert Downey Jr signed on to do Iron Man, it was the traditional trilogy contract. i.e. he signed on to Iron Man 1, 2 and 3. But now that the Marvel Cinematic Universe was in play, they had to sign Downey to a new, separate contract for The Avengers. If they couldn't sign Downey for the Avengers, then their contingency plan was for SHIELD to go, "Oh, we don't need the consultant for this. Let's get the government Iron Man to do this!" and War Machine would be called up. That being said, Downey was able to re-negotiate his original contract for a significant pay increase. And that's why Terrance Howard didn't come back was Rhody. As I mentioned last time, Iron Man was essentially Downey's big comeback film. As such, he didn't work for much. The rumour was that Terrance Howard actually got paid more than Robert Downey Jr on the first Iron Man. Anyway, Downey gets his raise, so of course Howard goes, "This means I get a raise, too, right?" And Marvel said, "Ha ha! Nope." Howard called up Downey for a little back-up, and Downey was all "New phone, who dis?" So so long, Terrance Howard. And all these behind-the-scenes shenangians are probably why Iron Man 2 never lived up to the awesomeness of the first film. That being said, I still like it. I don't know why I'm more forgiving of all the cramming in of extra stuff that has gone on to annoy me. Maybe because the concept of the cinematic universe was still new enough that I was more tolerant. Maybe because the spring of 2010 had let me down somewhat, as two of my favourite directors -- Tim Burton and Kevin Smith -- had both released films that kind of disappointed me -- Alice in Wonderland and Cop Out, respectively. Iron Man 2 was the first film of 2010 that didn't disappoint me. It's been six months since Tony Stark stood before the world and said, "I am Iron Man," which only made him more of a rock star than he already was. He's single-handedly taken out terrorists, and now he's re-launched the Stark Expo -- an event of his late father's design, a kind of combination world's fair and tech conference where the world's best and brightest can brainstorm. But, this is all taking a toll. The government demands that Tony Stark turn over the Iron Man suit to the military, as they're worried about that much power being in the hands of a private citizen. It's strange seeing this now, seeing as to how far we've come in the Marvel Cinematic Universe. This is very much the argument made in Captain America: Civil War, but at the start of his superhero career, we see that Stark is very much on Team Cap in that he's afraid of how that much power would be abused by authority. But Tony has a dark secret. The palladium core, which is a key component of the ARC reactor that powers the Iron Man suit and keeps Tony alive, is toxic. The ARC reactor is slowly killing Tony. We see now that Tony is searching for a cure, while desperately trying to make the most of the time he's got left. Things come to a head when Stark is driving in the Monaco Grand Prix, only to ambushed by Ivan Vanko. In the film, Vanko is an amalgam of Whiplash and the Crimson Dynamo. We learn that Vanko's father had been working with Stark's father on the original development of the ARC reactor, and that Vanko's father was deported back to the Soviet Union when it was learned that he was selling secrets on the black market. The senior Stark went on to become the Stark we all know and love, while the senior Vanko died in obscurity. So now Ivan has built his own ARC reactor, and is out for revenge! But Iron Man subdues him, and Vanko is arrested. But...Vanko is soon busted out of prison by Stark's main competitor Justin Hammer. You've got to love Sam Rockwell's portrayal of Hammer. Hammer is a guy who so desperately wants the world to embrace him as the next Tony Stark, but he comes across as desperate, and so his attempts to be as cool and suave as Tony Stark always comes across as awkward and cringe-worthy. It's a great performance. Hammer puts Vanko to work to devise his own powered suit to sell to the government. And this is where our middle section drags, as Vanko disappears for the entire second act. Tony, dealing with his slow demise, becomes increasingly erratic in his behaviour, culminating in a birthday party where he drunkenly shows off in the Iron Man suit, frightening his longtime friends Pepper and Rhody. Wanting to end this, Rhody swipes one of the other Iron Man suits for his own, and Iron Man and War Machine throw down. And that leads to one of the better scenes in the film. You know, the one that starts with Tony lounging in the giant donut when Nick Fury comes to talk to him. Tony lays his cards on the table, and Nick Fury sets him straight. It's interesting. From day 1, Favreau said he wanted to try and ground these films in realism. Originally, this scene was supposed to take place in Nick Fury's office on the SHIELD Hellicarrier. But wanting to ground things, Favreau moved the scene to a diner. And then, he told Downey to play it like an alcoholic who had fallen off the wagon and Samuel L. Jackson to play it as Tony's sponsor. It totally works. In fact, one of those things that I never picked up on was Tony's erratic behaviour brought on by his poisoning was meant to be a science-fictional counterpart to Tony's alcoholism in the comics. Guess they figured that just outright alcoholism would be too heavy for a family film. Anyway, Fury gives Tony a bunch of Tony's father's old research on the ARC reactor, and it turns out the problem was that it was never meant to use palladium, but a yet-to-be-discovered element. Tony finds the atomic structure of this element hidden in his father's plans for the Stark Expo, throws together a particle accelerator in his workshop so he can synthesize it, and boom! New, non-poisonous ARC reactor, the poison leaves Stark's system, and just in time, because Hammer is unveiling his new Vanko-designed drones at the Stark Expo, which Vanko unleashes on the crowd, causing Iron Man and War Machine to mow down an army of evil robots, before Vanko shows up in his new Crimson Dynamo armor, and they fight to the finish. It could have been better if they streamlined it a lot more, maybe made the Iron Man v Vanko the main plot thrust, and then we wouldn't have had that slow midsection. But I still like it, and that final robot battle delivers. So, yeah. It's good but not great.